Synopsis (from the publisher): Deborah Harkness's debut novel A Discovery of Witches introduced Diana Bishop, Oxford scholar and reluctant witch, and the handsome geneticist and vampire Matthew Clairmont; together they found themselves at the center of a supernatural battle over an enchanted manuscript known as Ashmole 782. 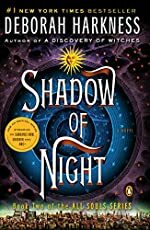 Now, picking up from A Discovery of Witches' cliffhanger ending, Shadow of Night plunges Diana and Matthew into Elizabethan London, a world of spies, subterfuge, and a coterie of Matthew's old friends, the mysterious School of Night that includes Christopher Marlowe and Walter Raleigh. Here, Diana must locate a witch to tutor her in magic, Matthew is forced to confront a past he thought he had put to rest, and the mystery of Ashmole 782 deepens.